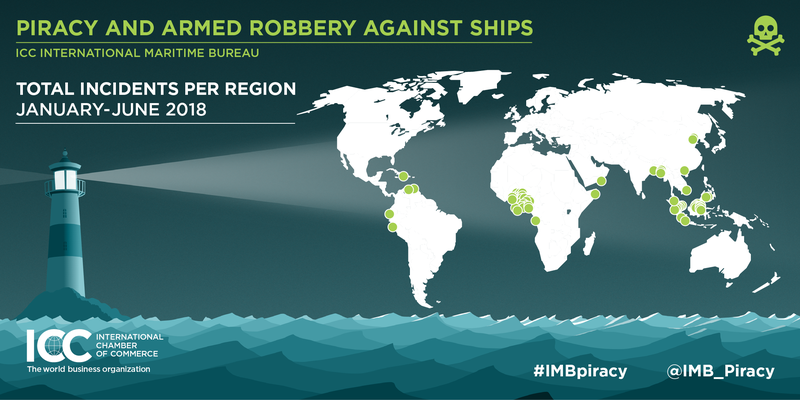 The second quarterly report from the ICC International Maritime Bureau (IMB) shows that all 2018 crew kidnappings have so far occurred in the Gulf of Guinea in six separate incidents. 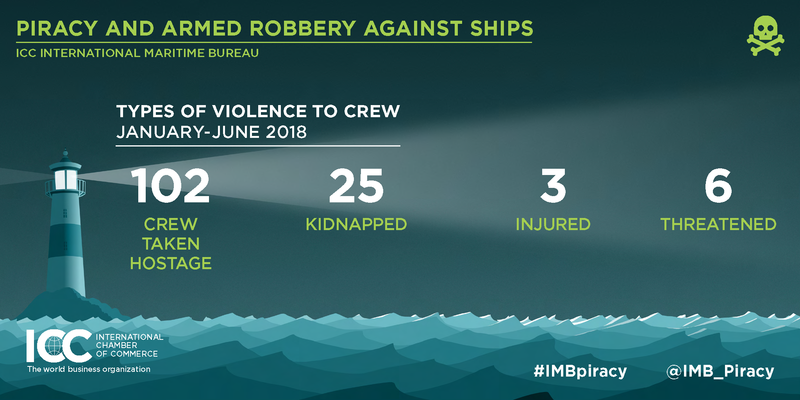 A total of 107 incidents were reported to the IMB Piracy Reporting Centre (PRC) in the first six months of 2018. In total, 69 vessels were boarded, with 23 attempted attacks, 11 vessels fired upon and four vessels hijacked. No vessels were reported as hijacked in the second quarter of 2018. The number of crew members taken hostage increased from 63 to 102 compared to the same time period in 2017. The number of crew kidnappings decreased from 41 by the second quarter in 2017 to 25 so far in 2018. However, all 25 crew kidnappings reported this year have occurred over six incidents in the Gulf of Guinea, highlighting the higher risks in this area. Moreover, the true number of incidents in the Gulf of Guinea is believed to be “significantly higher” than what is reported to the IMB PRC, says the report. Outside the Gulf of Guinea, the number of 2018 incidents decreased in other piracy hotspots. There were no reported incidents recorded off the coast of Somalia in the second quarter of 2018. Masters are however again urged to continue to maintain high levels of vigilance when transiting the high-risk area and to follow the latest version of the best management practices. The number of incidents in the Philippines dropped from 13 by the second quarter of 2017 to three in the same time period this year. Launched in 1991, the IMB PRC is a 24-hour manned centre that provides the maritime industry, governments and response agencies with timely and transparent data on armed robbery incidents received directly from the master or owner of vessels. All attacks reported this year can be viewed online on the 2018 IMB Live Piracy Map.